We provide access control solutions for home and business owners in Hampshire and Surrey, specialising in a range of products to meet individual needs. Having a premises that simply opens with a key may not be sufficient enough security for your home or business. This is why Lockmasters provide access control solutions to make your property more secure. We have been providing access control solutions for home and business owners in Hampshire & Surrey for over 30 years. We provide Access Control and Door Entry Systems for Businesses, Schools, Local Authorities and Private Customers so no job is too big or small. We install from simple mechanical keypads through to multiple site integrated access systems with time / attendance & computerised central monitoring and control facilities. 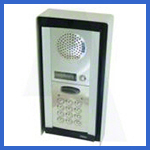 We can specify from a huge range of products including card, proximity, code or biometric readers, audio or audio visual call points, full door automation or magnectic/electric solenoid locking. This wide range of security gives each individual a choice of security most suited to them and all of our engineers are fully trained in all aspects of access control. With many engineers in Hampshire & Surrey you can be sure that a Lockmasters access control specialist won’t be far away from you, so call your local branch today, fill in our contact form or email enquiries@lock-masters.co.uk and a member of the team will be happy to help.